After UTT published it’s article yesterday (12/19/16) revealing Muslims are conducting pre-operation surveillance in American churches, UTT was contacted by law enforcement, intelligence sources and others. From these discussions it was revealed that members of the Council of Islamic Organizations of Greater Chicago (CIOGC) are using interfaith outreach with Christian churches and Jewish synagogues for the purpose of (1) studying them internally to determine how to best influence their congregations to soften them towards Islam, and (2) to conduct pre-operational surveillance of the churches and synagogues. Law enforcement officials are aware CIOGC is tied directly to the U.S. Muslim Brotherhood, and is heavily influenced by Hamas doing business as the Council on American Islamic Relations (CAIR). It is UTT’s professional opinion the Executive Director of CAIR, Nihad Awad, is the Muslim Brotherhood’s General Masul – the leader of the Muslim Brotherhood in the United States. 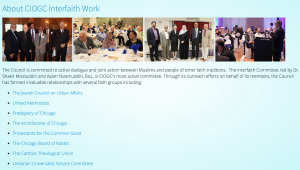 The CIOGC is considered by some in the Chicago community as a “moderate” organization working to “bring the community together.” In fact, they are using and manipulating non-Muslim religious leaders to intentionally weaken their positions so Muslims will have an easier time controlling public opinion and the opinion of the Christian/Jewish congregations so when violence strikes the Christians and Jews will rely on – not break from – the jihadis posing as friends. An example of how this will work here in America is the killing of a Catholic priest in France in July 2016. Muslims killed the priest during Mass, and within days, Christian and Jewish leaders were standing arm in arm with the leaders of the jihadi muslim community who support jihad and killing priests. Exactly the objective of the efforts of the Islamic leaders. Relatedly, UTT also received reports Monday confirming other churches in the U.S. are experiencing similar episodes as described in UTT’s article about churches being surveilled by Muslims. UTT stands ready to assist church leadership to provide consultation, briefings, and training. Because of the increased threat to U.S. churches, UTT has changed it fee for programs in churches, and for the time being will conduct briefings for churches on the Islamic threat for a significantly reduced rate. Please contact us at info@understandingthethreat.com for more information. On a day when a muslim Turkish policeman assassinated the Russian Ambassador to Turkey and two muslims plowed a truck into a crowded Christmas market in Berlin, Germany killing at least 12 and wounding approximately 50 others, American religious leaders need to get attentive quickly and face the wolf inside their house. What is your fee structure ? As Stephen Coughlin pointed out in *Catastrophic Failure,* the churches which permit Interfaith Outreach with Islamic groups are those churches which have already abandoned all pretense to Biblical Christianity; their’s is a this-wordly faux Christianity, whose prime objective is social justice — they are generally, but not always, very left-wing, politically. But it’s the fad, you see. They are very “hip” and praised profusely by the leftist liberal media, among others. Apparently Warren has no idea that he’s being used; yet, he would know he’s a pawn if his theological radar were more finely tuned. inasmuch as four-thousand-four-hundred-84 days since 9/11 have since drifted by while U.S. Christian & Jewish religious “leaders” continue to cringe behind a trinity of: feigned disbelief, moral cowardice and willful denial regarding the intent of a burgeoning army of sharia-adherent Islamists in their midst, I find it hard to imagine what more the Muslim Brotherhood & Counsel of Islamic Organizations in Chicago (or indeed anywhere else) could possibly do to further “soften” their congregations toward Muslims. Although, however, by never allowing one of their weekly services to pass anywhere in the country without a contingent of volunteers, representing their “flock”, gathered in front of their respective house of worship under the banners of the United States of America and their respective religion – for starters – might help; I.e. Stand up & fight!